How does such an awesome little spring blooming bulb (tuber if you want to get technical) fly under the radar for so long? 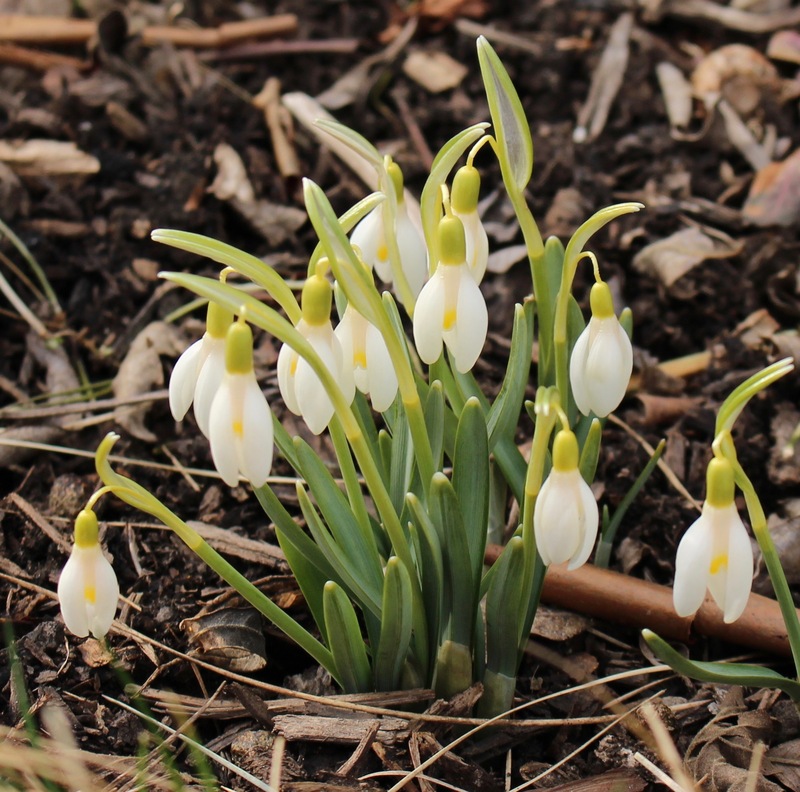 Apparently a couple in-the-know gardeners have been growing these cool little spring bloomers for years, but I for one didn’t even know they existed until a few years ago. 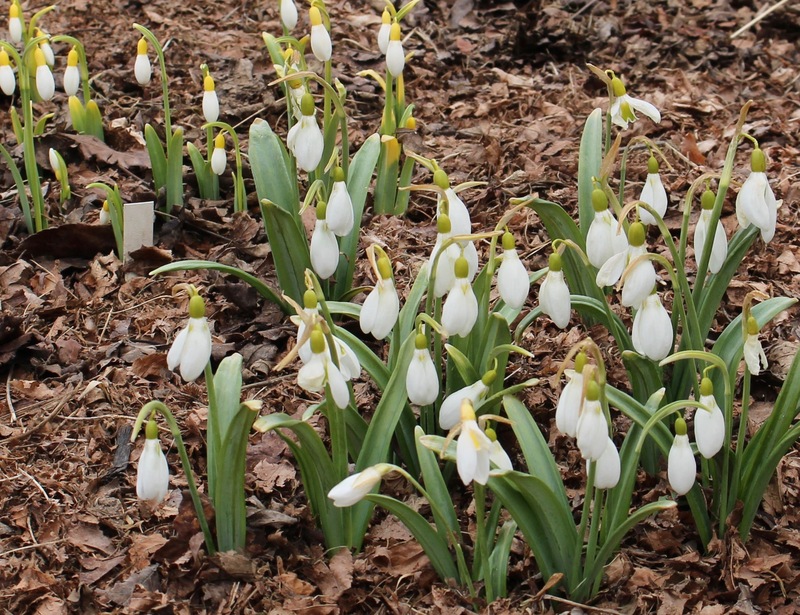 I believe I came across pictures via Ian Young’s bulb log (if you’ve never been, click here immediately to visit -it’s practically required reading for any bulb lovers out there) , and the impression was one which ate away at me until one fall I was finally able to get my dirty fingers on a few. Of course as my luck would have it these were promptly killed, but the following year a more determined try proved successful, and the next spring I was just as pleased as I thought I’d be when they bloomed. 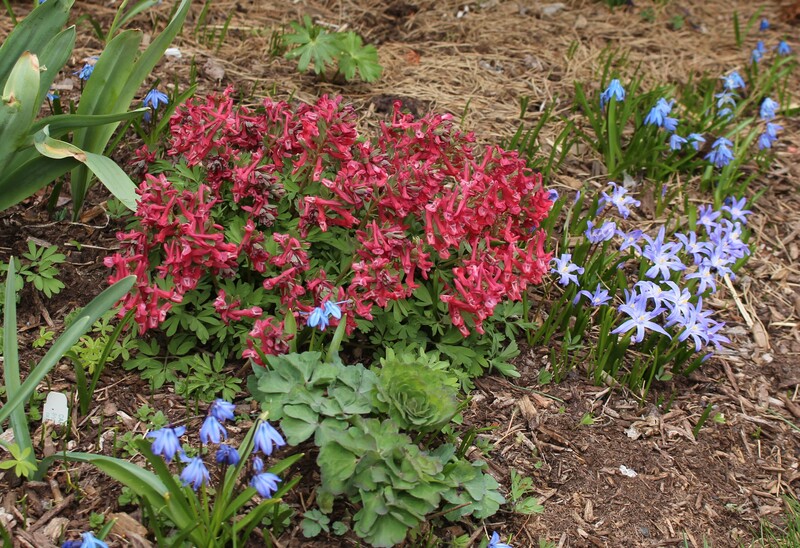 One of the boldest reds, Corydalis “George Baker” blooms right alongside the blues of chiondoxa and Scilla siberica. The Corydalis family is a large one with many highly collectible family members, but for me it’s the variations on Corydalis solida which excite me the most right now. This species ranges across Northern Europe into Asia and for the most part greyish mauves and blues dominate the color spectrum, but starting in the 1970’s and 80’s rich reds and purples began to find their way out of the woods and into the hands of collectors and growers. The Penza strain from Russia and the Prasil strain from Romania are the some of the best known groups for bold colors and many of the newest named varieties come from these collections. 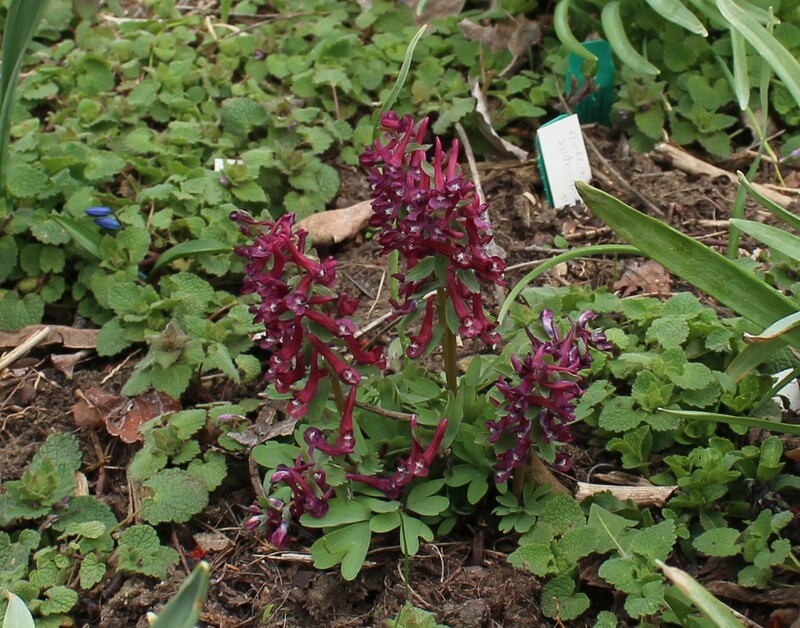 A more common color of Corydalis solida, a smaller and slightly later flowering plant than the other Corydalis I grow. As it is with many plants, once you get excited about one you get greedy and need more, so in addition to the “George Baker” and “Beth Evans” which were purchased from Brent and Becky’s bulbs, and the straight Corydalis solida from Van Engelen, I needed to add more. 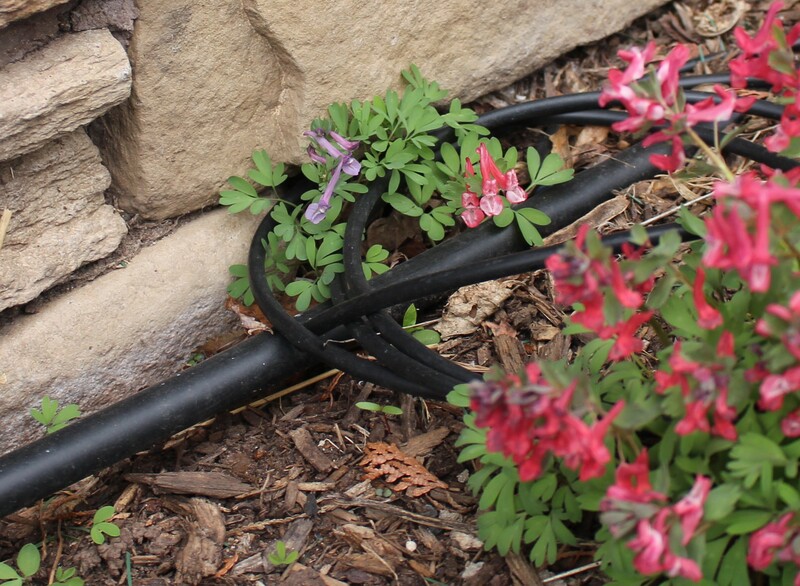 The blame for this shouldn’t lie entirely on my own shoulders though, since by now I had seen even more Corydalis glamour shots including the most enticing group shot which I found at Carolyn’s Shade Garden. Her tapestry of rich purple with pinks and reds would have to be imitated in my own garden and to that end I found Russell Stafford’s Odyssey bulbs. The new plantings from Odyssey were a mix of successes and failures and based on the excellent condition of the tubers, I’m going to guess the fault again lies with me. Even as recently as this spring one of the clumps failed to even show, and I suppose there’s something else going on which I don’t entirely understand… but ignorance is bliss, and I enjoy the remaining two cultivars more than ever now… even though the addition of a pure white or pink would have made the planting even more perfect! 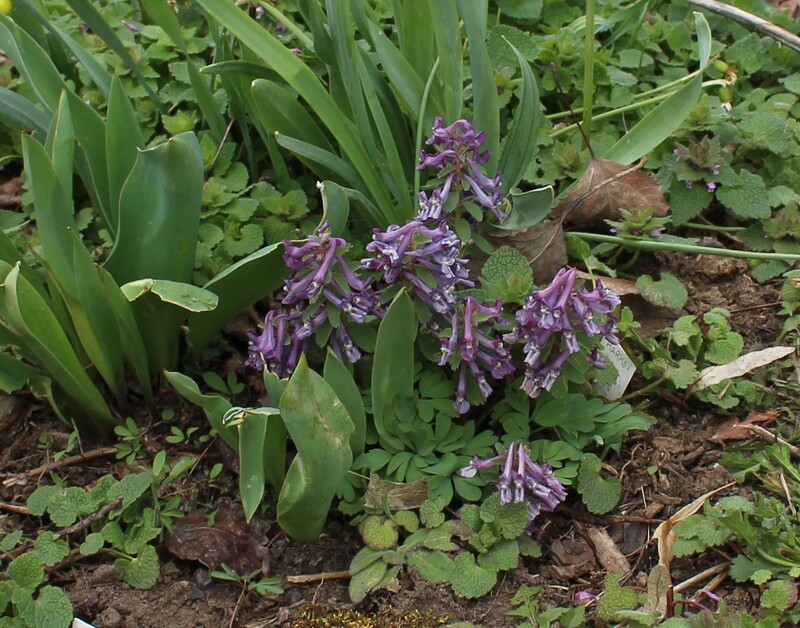 A more common color but on a sturdier plant, Corydalis ‘Harkov’ scared me by nearly dying last spring after I optimistically dug it up for dividing. It wasn’t ready and it wasn’t pleased, and promptly dried up and went dormant. I suppose I should try and make this a more useful post by mentioning something other than the many ways in which I’ve killed these plants. They’re actually fairly carefree in the right woodland conditions, and although I should suggest a fertile, moist shaded site, mine grow quite happily in sites I would consider downright dry, and in locations shaded only by the overhanging perennials and annuals of the front street border. I guess they don’t know any better. Another thing I should mention is they bloom early and fade away quickly. Plant them in a spot where other goodies such as hostas and hellebores or rudbeckias and buddleia fill in for the summer. My best patch disappears under a carpet of aquilegia (columbine) and ‘Blue Cadet’ hosta two weeks after blooming, and you wouldn’t even know it was there in June, which is good, but you should definitely try to avoid forgetting they’re there and running a shovel through while digging. 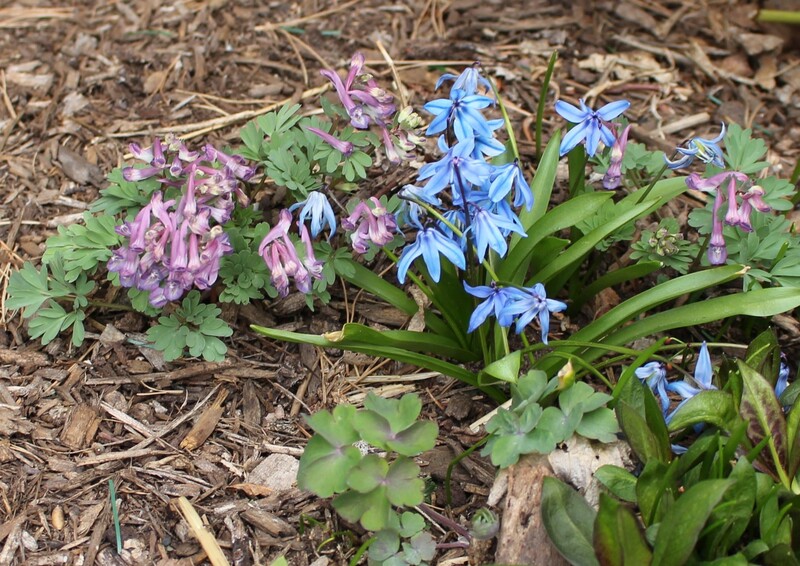 Corydalis, hyacinths and hellebores filling in now that the snowdrops and eranthis have gone over. 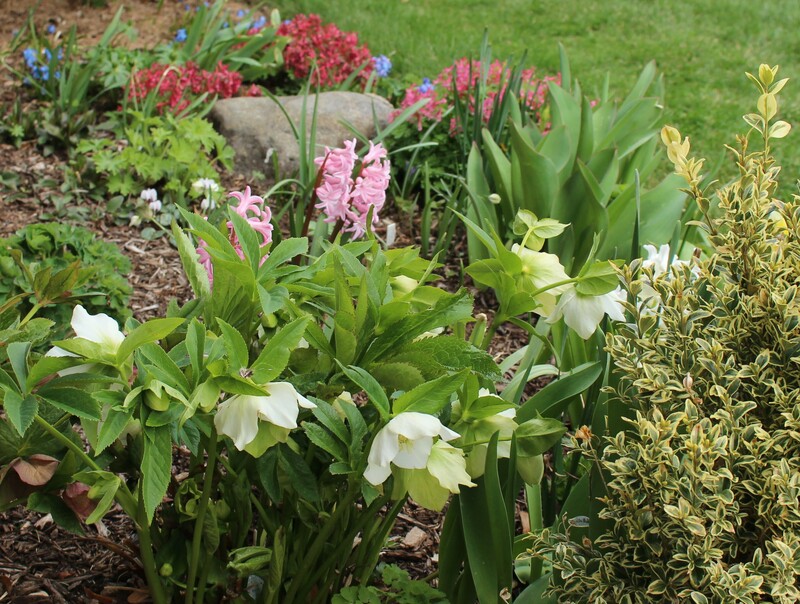 In another month columbine, delphinium, hostas and hellebore foliage will take over for the summer. A final note is that for the first year or two in my garden I was convinced they couldn’t possibly be making seeds since they yellowed and died down so quickly after blooming. I’ve since found out I’m wrong. Seedlings are spreading quickly and this year I have a few of the first starting to put out their own blooms. I’m thrilled that they are as red as the parents, and even happier there’s some variety to them as well. Some of the first Corydalis solida seedlings to make it to blooming size. One’s nearly as red as the mother clump of ‘George Baker’, the other’s a completely different dusky mauve. So now the question is should I just enjoy what I have or should I keep trying to expand the flock? If I could only remember where I planted them (I think I may have finally spotted one or two this afternoon) I would be able to enjoy a few new ‘Purple Bird’ flowers this spring, but is that enough? It should be, but history shows little attention to common sense in this garden and I’m already well on my way to picking out just a few more indispensables. 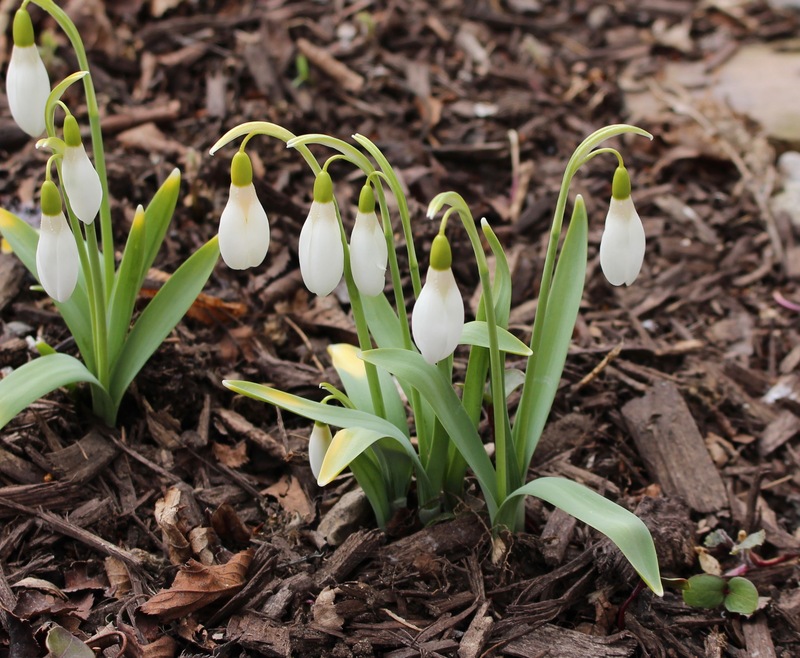 You really shouldn’t show too much restraint in spring, it goes completely against the spirit of the season and even when ordering bulbs for fall planting it’s still a celebration of the end of winter! 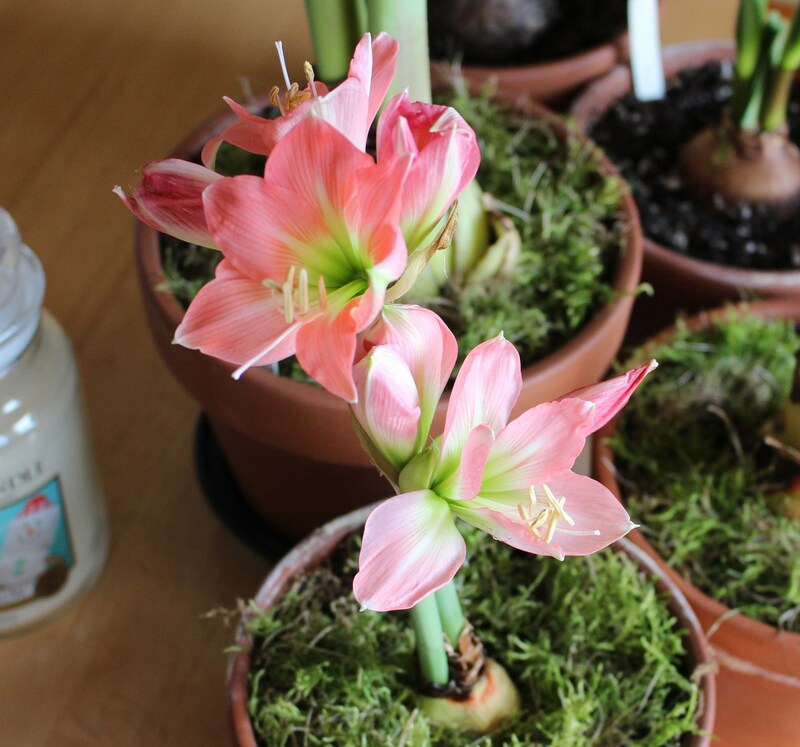 The new amaryllis are coming into bloom and between them and mommy’s valentine’s day roses things are looking very festive around here. I don’t mind one bit but it’s surprising to me that the dirty flower pots at the end of the table are being tolerated as well as they are. Usually non-edible growing things are frowned upon in the dining area. The girl picked out some nice roses this year and although red is always a valentine’s day favorite, I and hopefully others love this blend of colors even more. The timing on the double red amaryllis also couldn’t be better, I believe it’s ‘red peacock’. 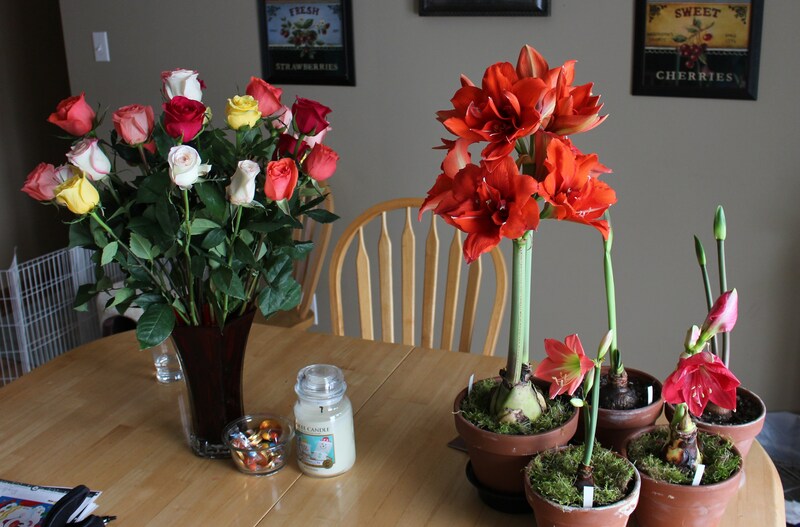 During a weak moment this winter I came across a clearance sale for amaryllis (hippeastrum) and decided to treat myself. Treating yourself is always a good idea in December and soon enough a few new amaryllis were sitting at my door. Since I was already buying cheap bulbs of a flower which I really don’t need, I decided to try something new and picked a few doubles and miniatures. So far so good! All the amaryllis were planted in nice new terracotta pots which I’m ashamed to say required more time and effort to find than any of the actual bulbs. Apparently clay pots are not filling the shelves during the holiday shopping season…. or at least not filling the shelves at the first three places I tried… but persistence paid off. Hopefully the bulbs will appreciate my struggle. As the bulbs settle in and sprout there are more things coming into bloom in the garage. 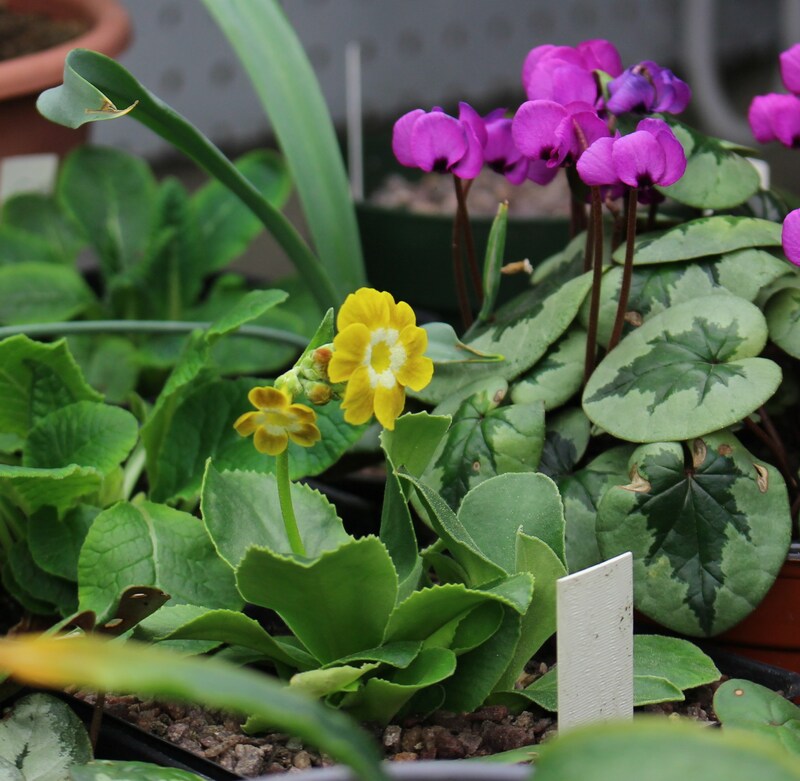 I’m especially pleased to announce the opening of my little auricula primrose. The color is a mustardy yellow which although very ‘refined’, wouldn’t be my first choice for a show stopping color. I love it though and am looking forward to seeing a few more blooms opening over the next few days… and hopefully having the flower stem straighten out to get rid of some of the ‘nod’ it has! My lovely little auricula growing under lights. I can’t seem to do a decent job photographing yellow, but hopefully you can still make out the mealy white center which makes these flowers so distinctive. Outside is a different story, and it’s a mix of hope and optimism as well as worry. We had enough warmth earlier in the winter to bring on a bunch of stuff way ahead of schedule, and some of those things paid a price for their eagerness when the bottom fell out of the thermometer. 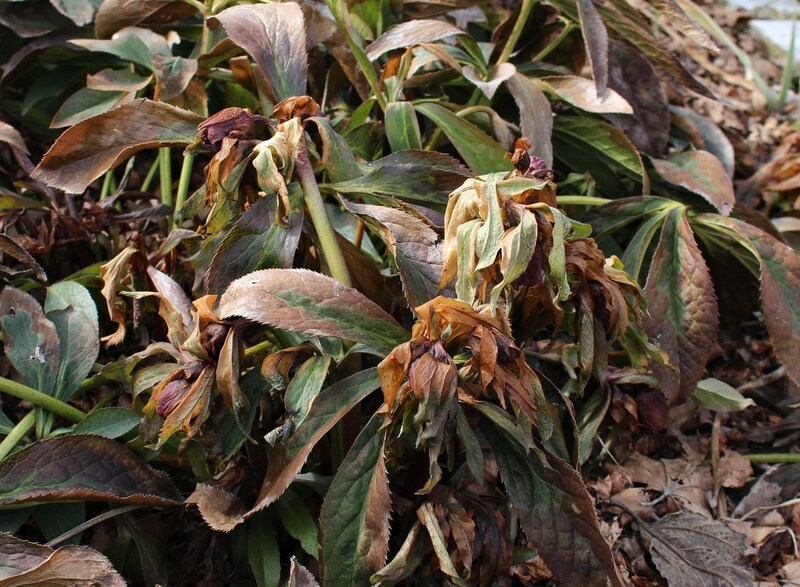 The hellebores in particular are looking sad. I don’t know if this hellebore will recover to bloom this year. It won’t die, but the freeze damage doesn’t look good. Also sad are a few of the daffodils. Early risers such as anything with tazetta or jonquil blood (two of the many daffodil species crossed for the hybrids we have today) were mushed back to the ground. Some will die, but most will carry on and just have browned tips to their leaves when the blooms come up. 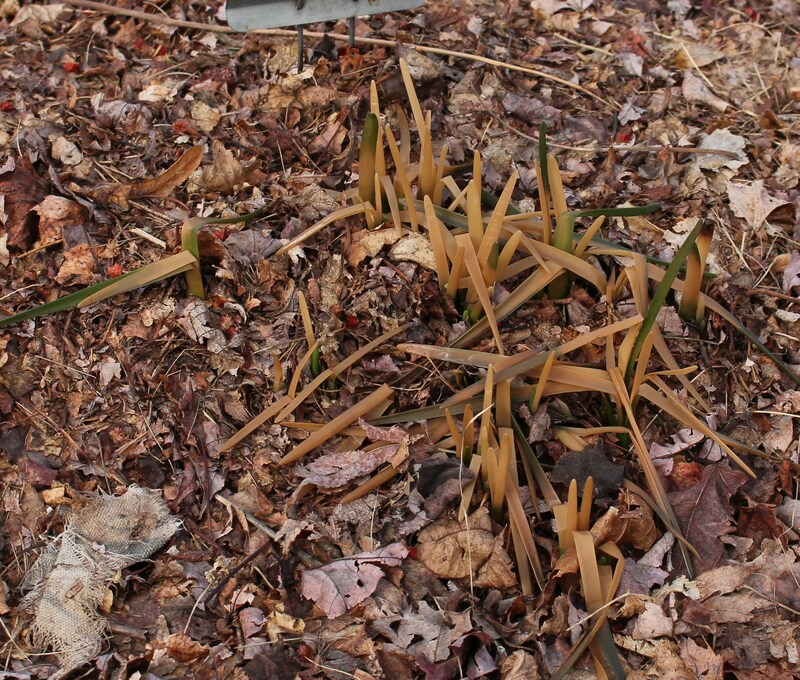 Freeze damage on early daffodil foliage. In spite of the way they look I think they’ll be ok. The buds and more leaf will continue to sprout once things warm again. The bad news is that after a few spring-like days we and the rest of the East coast are having some of the coldest nights of the winter. 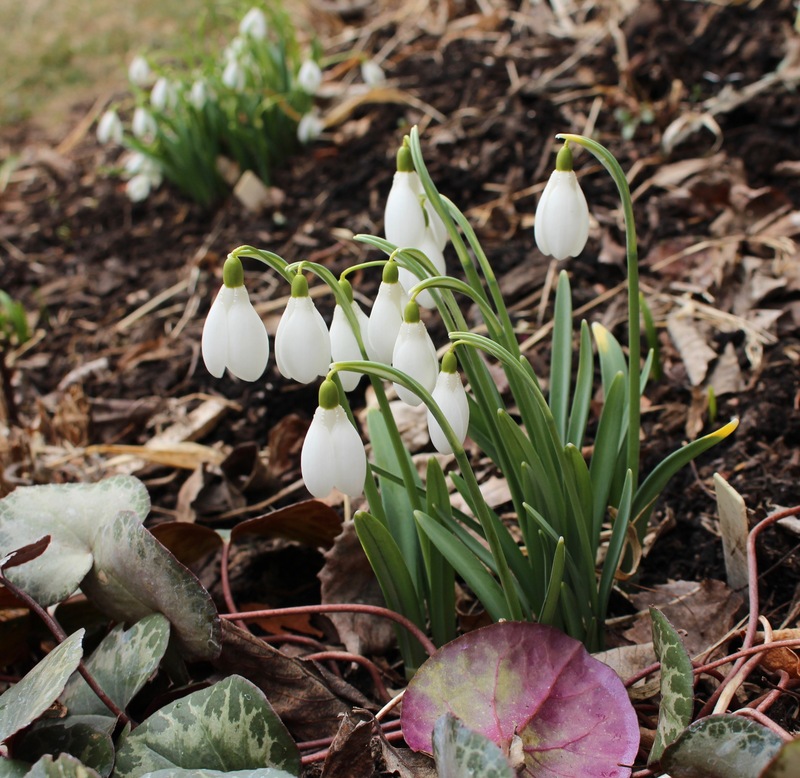 I would feel much better if a nice blanket of snow covered up last weekend’s early bloomers but just a dusting of snow accompanied the cold snap. For now ignorance is bliss and I’ll again enjoy last week’s signs of spring as we slowly warm up from a blustery low of -8F (-22C) last weekend. ‘Wendy’s Gold’ and ‘Gerard Parker’ in bloom last week. 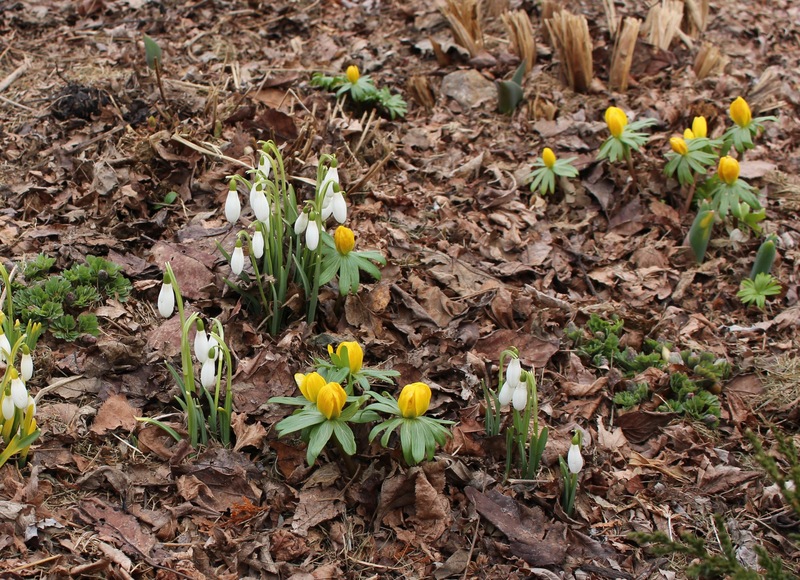 I loved the early glimpse of spring, but this week had to scrape traces of snow off the lawn in order to pile it over them for a little extra cold protection. 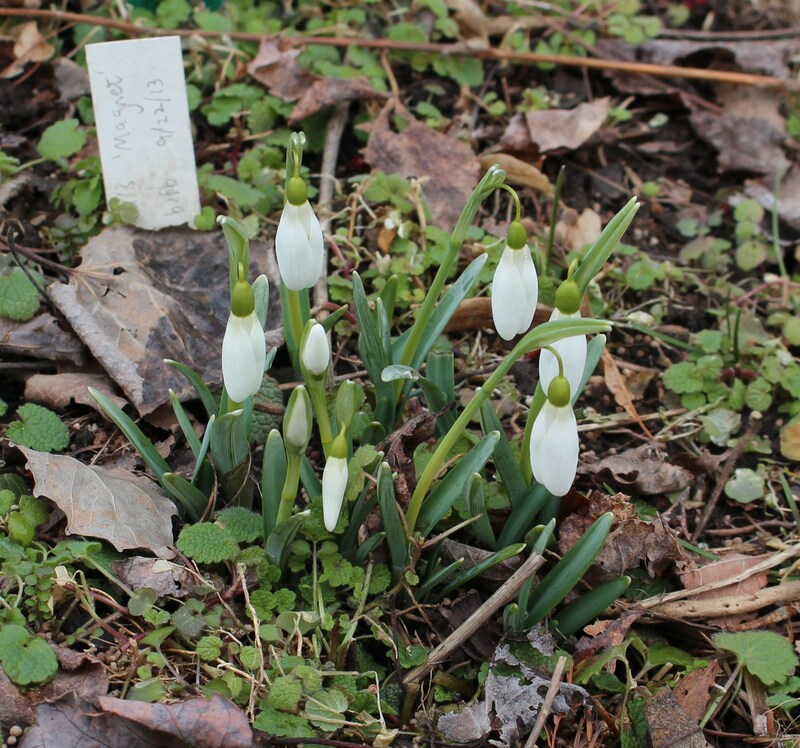 I should know later this week if there is any damage to my snowdrop treasures. 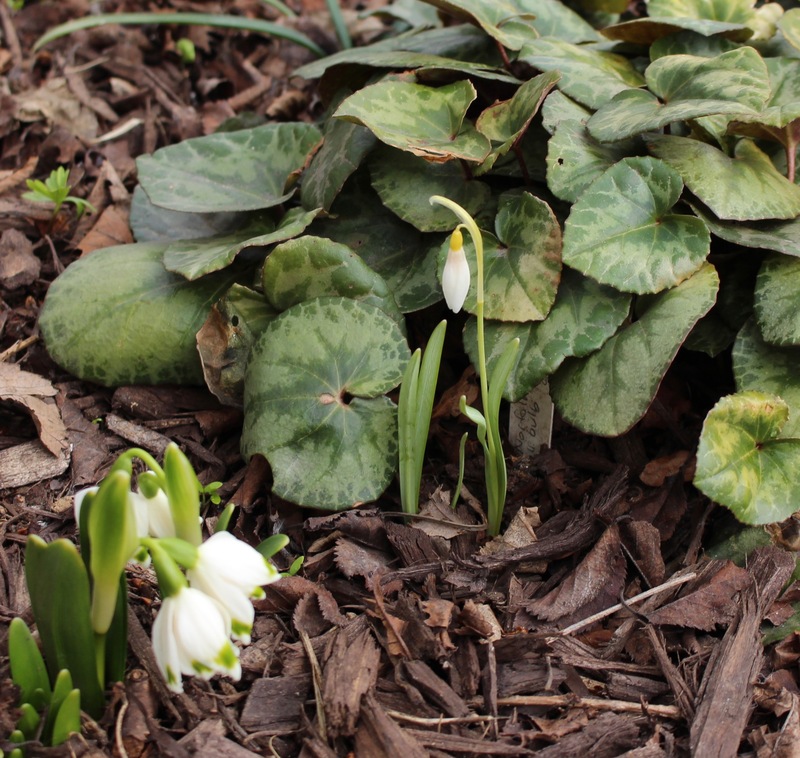 I remain optimistic, but sadly enough in years past I have had it that drops have died from a late season arctic blast, and these bloom are far along, and this cold snap is severe. But what can you do? Wendy and Gerard got a box over them but I’m not ready to go all over the yard covering things for each cold snap. 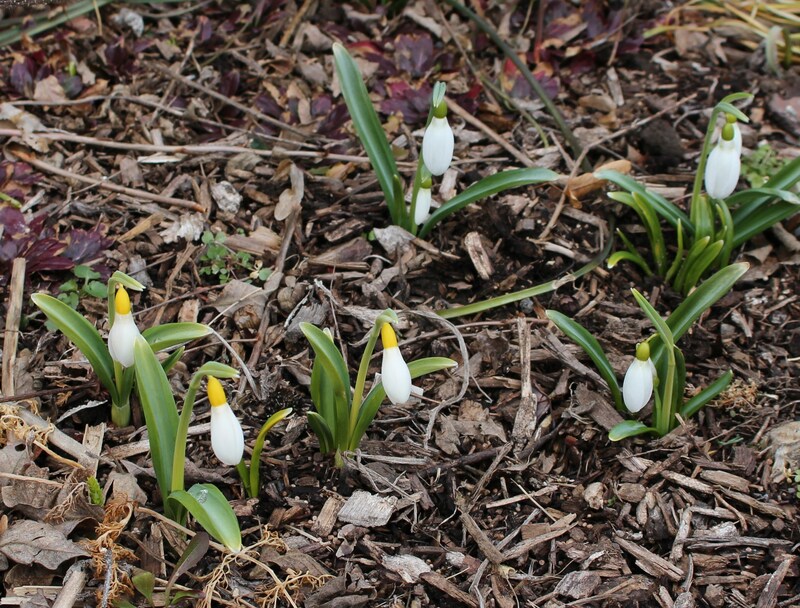 These bulbs will have to show their true colors. 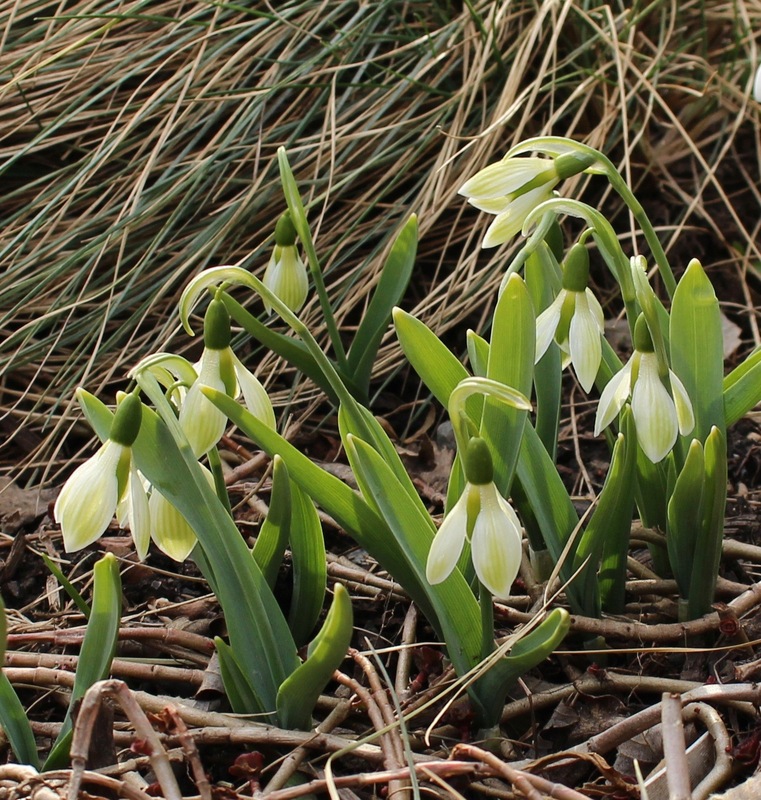 Galanthus ‘magnet’. This one’s on his own so I’ve got my fingers crossed for these next few days. If worse comes to worse I’ll be able to try ‘magnet’ again from a different source, since I’m not positive this one’s correctly labeled. Wish my bulbs luck. 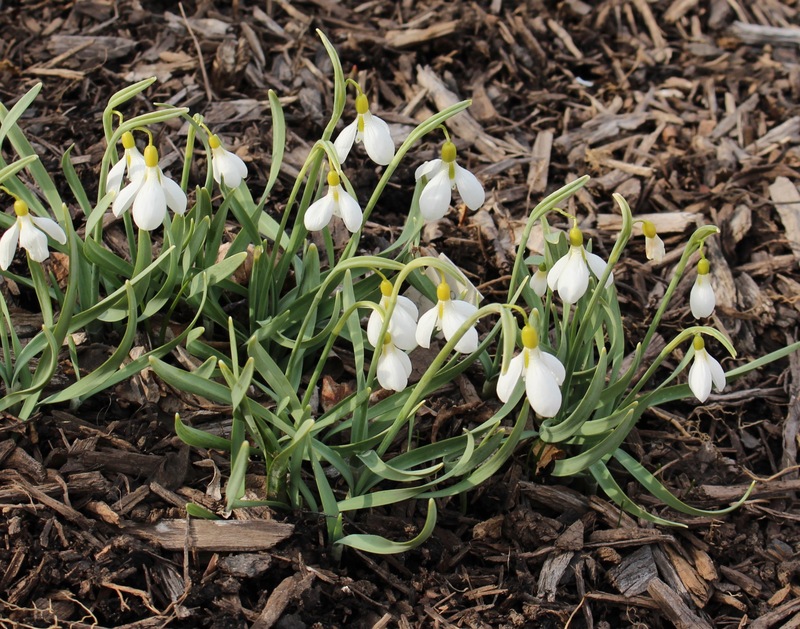 If they do survive I will never underestimate the hardiness of some of these earliest bloomers. 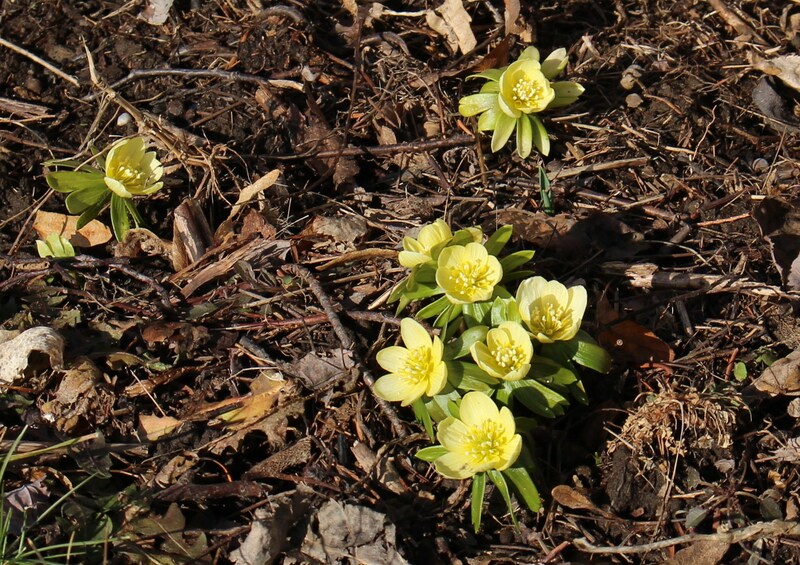 Last week’s show of the aptly named winter aconite (Eranthis hyemalis). I love this pale version of the usual bright yellow.